Survive! knives have quickly become one of the most popular and highly sought after knife brands on the market today. Specializing in high-end fixed blades and neck knives, Survive! knives have quickly caught the attention of many knife enthusiasts, but especially those who are big proponents of outdoor/survivalist knives. Based out of Pennsylvania, Survive! knives owner Guy Seiferd stands behind his products 100% and offers a lifetime warranty just like many of the big manufacturers today. These elite fixed blades offer a wealth of options including bow drill divots, ferro notches, different micarta handle colors and even sheath colors. For blade steel they are utilizing mostly CPM 3V and even CPM 20CV–both offering superior edge retention, corrosion resistance and great impact strength for even the toughest of applications–just like a true fixed blade should be. The most recent knives to hit our shelves has been the 6.75″ blade 7/7 model which is only just the 5th production model to be released from Survive! knives. Previously we have seen the necker knife, the 4.1 model, the 5 model and finally the 5.1 model. The model numbers due in fact correlate with the blade size so make sure you keep an eye out for future models such as the necker II, the 3.5 model, the 6 model and even the 10 model. A quick video comparison of a few different variations of the Silent Soldier. Just in, we have two variations of the 2nd Generation Silent Soldier Neck knives from Brous Blades. These are high quality, D2 steel neck knives that are built to perform. They come with a fantastic sheath. Check them out on the website. 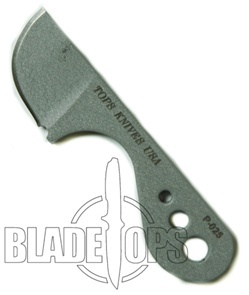 The TOPS Knives Thumb Nail Knife is one of the best little knives we have found on the market. This knife is great for your survival kit, your backpack, or wherever you may find yourself. Great grip, comfortable to hold, the blade shape gives you lots of cutting power. Comes with a Kydex sheath. The Cold Steel Point Guard knife, inspired by a Fred Perrin designed custom knife is an incredibly thin, flat knife. Extremely light, the Point Guard knife comes with a Secure-Ex sheath. Made specifically for your hand, this knife is made so you can use the shortened pistol grip comfortably. The G-10 scales and the skeletonized style make it almost unbelievably light. This is one of the better neck knives we have seen on the market. It can also be carried in a pocket, on a belt or even on a leg strap. Cold Steel has dedicated themselves to making the strongest, sharpest knives in the world. Since 1980, they have been producing high quality knives that serve specific as well as general needs for knife users. One of their knife lines, the Mini Tac Series, are neck knives. These knives are all light and come with a Secure Ex sheath. Each one can be worn on a neck chain or you can carry them on a belt or almost anywhere else you can think of. The Cold Steel Mini Tac Knives may be some of the smaller knives that you come across, but they perform just like a full size knife. Their blade lengths range from 3″ all the way up to 3 3/4″. What does this mean to you? It means that even though your Mini Tac knife is small–you aren’t giving up any blade real estate. These knives are each made with a shorter handle than a normal knife, but this doesn’t affect your ability to hold and use your Mini Tac Knife. As you can see in the picture of the Mini Tac Kiridashi knife above, these knives are made with a comfortable spot for your forefinger. These knives are flat and sport a full tang. Beacuse of these design features, the Mini Tac knives are amazingly easy to hold onto and don’t roll or twist in your hand. If you haven’t tried a Cold Steel knife, a Mini Tac might be a great intro knife into their amazingly full line of high quality, well built knives. But be warned, once you get your first Cold Steel knife, it is hard to stop. They are addictive. We just got into stock a bunch of new Cold Steel knives that will be showing up in the next few days. The first one I put into the system was the Mini Tac Beaver Tail. This is sure to be an extremely popular knife. When we first get knives, we typically order just a few of them to make sure they are the kind of product we want to sell at BladeOps.com. I have generally liked everything that Cold Steel makes. They make an extremely durable and strong product with a specific market in mind. The Mini Tac Beaver Tail knife is incredible. It is small enough to carry on a neck chain (provided). Or you can carry it in your pocket–or really just about anywhere since it is so small. The blade shape is unique, and extremely useful. But the all time best thing about this knife is the handle. It is short, but shaped so that it feels like a big size knife in your hand. Some small knives, you grab onto them and you feel as if they are too small to do anything with. The Mini Tac Beaver Tail gives you a ton a control. It has a specially designed finger spot for your forefinger which gives you all kinds of control of the knife. Made with G-10 handle scales, the knife is a full tang design which increases it’s strength. This is a great little knife for nearly any situation.